It is one thing to conduct an evaluation of drivers' performances over the season based on what we’ve seen, but what could be better than coming to conclusions based on analysis of the numbers? I looked at a set of seven different parameters that I feel I can objectively generate a rating for, with the aim to use these to rank the drivers from worst to first, on more than just World Driver Championship point totals. You can find a full break down of the methodology and scoring in the companion post, There is method in the madness. It won’t come as a shock to many that as well as being towards the back of the pack, van der Garde is towards the back of the rankings also – driving for one of the ‘new’ teams is likely to do that to a driver. But it’s not all down to the car, Giedo is far and away the least efficient driver on the grid when it comes to tyre usage – he uses more than 0.5 sets of tyres per race above average, which is 0.25 above any other driver. He does score well in Coming From Behind, but that is most likely a function of starting an average of 17.1th place on the grid and each race having incidents and retirements. From the numbers Max has had a tough year in his Marussia. The combination of an average Accident Proneness rating and starting towards the back of the grid means that he scored well in Coming From Behind, but that’s about it for the young Englishman’s first season in F1. Fingers crossed he gets given another chance. Despite to start with looking like he was a mile and half better than his team-mate, Bianchi comes out only 1.43 points ahead of him. At the end of the season his stats mirror Chilton’s, while only being marginally ahead on Saturday and Sunday afternoons. Big things might be in his future, but my numbers don’t have him outshining his team mate, not this season any way. Before he even set foot in the car he was ahead of Giedo in the standings. Heikki may have the benefit of only having some of his scores averaged over two races, but this also hampers him as a Sunday Afternoon Specialist or in Overtaking as he does not possess a large enough sample size to achieve a representative average. The fact that all other drivers had 17 full races more than Kovalainen to get used to their cars, may well have hampered any hopes of climbing through the ranks. He said it himself, that he messed up both starts because he hadn’t had enough practice at it – it’s not easy to jump into a car and drive it on the edge. Not much can be made of JEV’s numbers, he is not particularly efficient with his tyres, which probably hampered his progress in other categories. What might well go down as a disappointing season for the Frenchman, and I can see why Red Bull passed on him. Crashtor did not fare well in 2013, clocking up the most incidents, but then that’s no surprise. He is ranked highly in coming from behind – that is in all likelihood helped when he shunts other cars and punts other drivers off the race track, or when he ends up having to overtake the Marussias and Caterhams numerous times after he’s been for another excursion off-track. From the numbers, the Mexican’s first season in F1 appears to be a mixed bag, all his Pesos may have bought him a midfield drive, but he could have made more of what he had under him. His high overtaking is likely down to Guti qualifying his Sauber out of position down the field, thereby being presented with more opportunities that he could take advantage of, or it could well just be down to his skill – you decide. Charles Pic raced in F1 in 2013, gaining a lot of places as he did so, unsurprisingly performed better than his team mate, but despite having the best chance, was unable to score the first points of either of the two remaining ‘new’ teams. The cleanest driver on the grid, Valtteri Bottas was, until the Brazilian Grand Prix, involved in none, count them zero, incidents this season; that was until he brushed up against Gutiérrez, shortly followed by Lewis Hamilton rubbing wheels, and ending the Finn’s race. Despite that Bottas still takes top spot in that category – a stark contrast to his teammate. On the strength of these numbers Bottas has been the top performing rookie driver this season. Some good performances in his first season back since his break might have just about revived Sutil’s career. He may not have performed as well as his teammate on Sundays, or across the other categories but he was by far and away not the worst driver out there in 2013. Massa’s biggest downfall in the rankings has been his Ferrari’s over-usage of its tyres. Felipe used 0.25 sets of tyres per race above average. He performed reasonably well in qualifying and the race, but he claims the unenviable title of being ranked most places below his 2013 WDC finishing position (six spots). Next season’s new kid in the Bull has had a good statistical season, outperforming his current teammate and further underlining that the sister team made the correct decision when calling him up to sit at the big boys table. Ricciardo was relatively kind on his tyres and for the most part kept out of trouble. A faster car in 2014 will see a dramatic jump in fortunes for Smiley Dan. The Hulk had some outstanding performances, particularly during the latter part of the season, outperforming his car at times. However, on average his stats are predominantly that; average, but maybe I’m just being mean. He was better than most in overtaking and his accident proneness – we’ll see how this compares when he makes another career sidestep next season. Despite a comparatively slow McLaren, that did neither of its drivers any favours, Pérez still managed to perform well during the races, being both fourth at overtaking and tyre usage. On the whole Romain Grosjean drove much better in 2013, however he still managed to pack his season full of incidents. His raw total of 11 incidents is somewhat misleading, as this number is skewed by his Monaco weekend which featured 4 crashes – one harder, one better, one faster, and his race-ending crash, stronger. The first half of the season may have left him sore, but the latter portion saw him soar up my standings – in the final races he was racing like a competent #1 driver. Paul doesn’t drive one of the fastest cars on the grid, so falls back into the pack in the qualifying and race rankings, but he does a great job of gaining places on a Sunday. He also is very efficient with his tyres, despite the Force India cars not favouring the redesigned constructions as much as other cars on the grid. On so many occasions Nico started at or towards the front of the grid only to fall backwards as the laps passed, losing on average 1.7 places per race which is good enough for joint-last. On the whole he kept his nose out of trouble, only having three incidents all season long. His skill and racing heritage, combined with his youthfulness will likely keep him around for a long while yet. A more consistent car in 2014 will make Nico a more competitive prospect on Sundays. Mark’s key strength this season was his overtaking – being in the fastest car, and often finding himself out of position down the field may have played its part in providing him with the opportunities, but it was still down to Webber’s skill to pull off each and every move. He qualified and raced well, and overcame a rather large amount of bad luck – be that the mechanical workings (or not) of his car, being crashed into by other drivers, or just a race win stolen from under his nose. 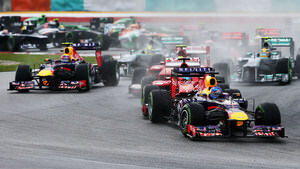 Webber has chosen a respectable time to bow out of F1 – at the top (team). Lewis’ good scores across most of the board (most notably his performance in qualifying) were significantly hampered by the Mercedes’ poor race-pace – much like his teammate he loses the most places on average per race, standing at 1.7 – excluding Heikki, who’s score is skewed due to its low sample size. ‘Going backwards’ on a Sunday afternoon is also the reason that his overtaking quota has taken a hit. He’ll be hoping that his 2014 ride is less greedy on its tyres, as that will boost his chances against other drivers in both these rankings and in the actual races. JB is six spots above his World Drivers Championship position, which is the biggest difference amongst the field – some drivers’ ability is far greater than the total WDC points they collect. The numbers tell us that JB is a smooth driver, performing well with his tyres and his overtaking, and from his years in the sport already Jenson will likely spend the second-most time in F1. He was hampered by his McLaren’s poor pace and balance issues, so to drag himself up to third despite this is quite some feat! Despite the Ferrari being very tough on its tyres (Fernando was ranked sixteenth), Alonso has done enough to secure himself second place. He’ll likely be around F1 the longest and was second to only Seb in average finishing position. He has kept his nose clean, only being involved in 2 incidents all season long. Scoring well in Quali and in overtaking helped Fernando on his way to outpacing the majority of the competition. By a process of elimination you might have already guessed the winner. Despite not driving in the last two races Kimi still has the best score, and is the best driver of 2013 (according to my scoring anyway). Other drivers have closed in on him and his rating has taken a slight hit, but his driving up until round 17 was enough to see him to the chequered flag in first place. He was first in Coming From Behind and in tyre usage (using an average of 0.31 sets of tyres per race below average); also Kimi was third in overtaking and his average finishing position was good enough for fourth overall. All in all, a very good season from the Finn, and that’s before you even start to consider that he’s upgraded his ride to a shiny red prancing horse in time for the 2014.